The discovery of the structure of DNA by Francis Crick and James Watson in the early 1950s ushered in a new era in molecular biologic science. This technologic and biologic revolution continued through the 1960s to today, and the explosion in technology has fueled the current expansion of knowledge into the working of the human cell. As of 2003, 99% of the chemical base pairs that make up human DNA had been sequenced to within 99.99% accuracy. In turn, as a result of research into the abnormal cancer cell, the basic understanding of the cell has greatly improved. Successful translational research has allowed gene therapy trials to proceed. Work across many laboratories is geared toward elucidating the genetics behind cancer, discovering cellular mechanisms that lead to cancer, and elucidating intracellular and intercellular interactions that allow this progression. Identifying candidate precursors or enabling genes may pave the way for cancer screening, as with the ret proto-oncogene and medullary thyroid carcinoma. One technique that is garnering wide attention in this realm is the DNA array, in which a number of different genes from an individual can be processed to look at certain genotypes. Eventually, new treatments will develop from these efforts. A few gene therapy trials now target head and neck cancer, which comprises only 4% of all cancers but has a dismal prognosis in advanced stages. [2, 3, 4, 5] Of the estimated 41,000 patients in the United States who develop this cancer each year, 13,000 are believed to die from the disease. In other parts of the world, head and neck cancer is much more prevalent. The male-to-female ratio in head and neck cancer is 2:1. An image depicting head and neck squamous cell carcinoma in vitro can be seen below. Head and neck squamous cell carcinoma in vitro (cell culture). Cancer is characterized by uncontrolled growth and division of a cell with extension beyond the normally limiting basement membrane and through the boundaries of normal cells. This, in turn, creates a clonal population of a single abnormal cell. Because of its mutated aggressive genetics, this cell has a selective growth advantage over its neighbors. Different theorists have argued how this mutation occurs. A reasonable model is based on colon cancer development. This is the multihit theory of tumorigenesis, in which a series of multiple triggering events in the genetic and cellular makeup of a cell ultimately cause cancer. Some modeling analyses suggest 5 separate events are required in colon cancer. These events lead the cancer cell to escape normal cell growth and control mechanisms, to avoid system control mechanisms (ie, immunologic surveillance), and to establish a nutrient supply. The multihit model postulates that several unique genetic mutations combine to cause cancer. However, which mutations are most important, which events must occur, and if a specific order is involved in molecular tumorigenesis is unclear. In colorectal cancer, multiple mutations are present. For example, in the hereditary cancer syndromes familial adenomatous polyposis or hereditary nonpolyposis colorectal cancer, mutations have been discovered in the APC gene and DNA mismatch repair genes. Although the exact process has not been elucidated, the sum of these mutations is believed to lead to cancer development in this model. In head and neck cancer, the histologic progression of severity from hyperplasia, dysplasia, and carcinoma in situ to invasion provides a framework to understand the genetic progression of cancer. Early clonal genetic events in benign hyperplastic lesions show losses at chromosomes 9p21 and 3p. p21 and other tumor suppressor genes' inactivation are therefore most likely involved in the first steps of the cancer model, with later stages possibly involving protooncogene activation and inflammation. One model postulates 6-10 genetic steps in the pathway from premalignant lesion to frank malignancy. Time and cumulative exposure to carcinogens are believed to greatly modify this risk and development. Among the risk factors for the development of head and neck cancer are alcohol and tobacco abuse, viral infection, and sun exposure. Each of these external factors has been studied in some detail. Tobacco has been determined to be carcinogenic in animal models. The effects of tobacco are broad and affect the entire mucosa of the upper aerodigestive tract. It may induce changes in a number of different cellular sites within the pharynx and larynx. This ability has led to one particular model of oral cancer development, field cancerization. In this model, not only is the local cancer a threat, but much of the surrounding tissue is also likely to become cancerous. This has necessitated resection with wide margins in the treatment of oral carcinoma. It also explains the high prevalence of second primary tumors in these locations, especially in the esophagus. Many of these second primary tumors, although separate in time and space, can be traced to a common clonal origin, with similar early genetic alterations leading to the pathway of cancer. Clinical data have shed further light on the mechanisms of tobacco-induced neoplasms. Certain individuals appear to have greater susceptibility to cancer caused by tobacco because of their genotypic makeup. Specifically, whether or not wild-type p53 is present normally or whether it is mutated, missing, or nonfunctional may affect one's risk of cancer. If p53 is mutated, missing, or nonfunctional, risk of cancer from tobacco use may be increased. Tobacco is known to have various mutagenic effects through the formation of free radicals and epoxides. Investigators have studied the body's response to these effects via detoxifying enzymes. One example, the glutathione S-transferase enzyme, which has numerous polymorphisms, may be related to the development of cancer in certain predisposed individuals. Another molecular scavenger, uridine 5'-diphospho (UDP)-glucuronosyltransferase, may increase risk of larynx cancer 3.7 times if present with low activity. Tobacco and alcohol use have a synergistic effect that increases the rate of cancer causation. This effect is not merely additive but also geometric. The risk of head and neck cancer in persons who smoke and drink is up to 17 times greater than the risk in persons who neither smoke nor drink. Viral infections have long been known to cause certain cancers and to be strongly linked to others. Well-known examples include human T-cell lymphoma virus (HTLV) in T-cell lymphoma and human immunodeficiency virus (HIV) in Kaposi sarcoma. In the head and neck, Epstein-Barr virus (EBV) has been implicated in the development of nasopharyngeal carcinoma, antibodies to which may help determine the prognosis. HPV types 16 and 18 have been implicated in cervical cancer. Another tumorigenic mechanism is by E6 protein–mediated pathways that lead to p53 degradation. Research has shown HPV DNA in a high proportion of oropharyngeal head and neck cancer. An inverse relation of HPV positivity in these cases with p53 has also been shown. This suggests a causal mechanism for cell proliferation. The link between HPV and other head and neck subsites, however, is unclear. Sun exposure is causally linked to squamous cell carcinoma of the skin, as well as to melanoma and basal cell carcinoma. Radiation causes DNA damage in the following 3 ways: directly (breaks DNA), indirectly through changes in oxidative enzyme systems (buildup of free radicals damages DNA), and indirectly to DNA repair mechanisms (causes faulty DNA). Similarly, irradiation has been shown to increase the risk for radiation-related sarcomas and thyroid cancer. Certain drugs may predispose one to cancer formation. For instance, immunosuppressive regimens may predispose patients to transplant-associated tumors. Other environmental agents associated with head and neck malignancy are the chewing of betel nuts in Asia (oral cancer) and nickel and wood dust exposure (sinus carcinoma). In addition to outward influences, intrinsic systems are at work in cancer development. For a cancer to grow, it must be able to avoid the body's immunologic cancer surveillance system. This system relies on major histocompatibility (MHC) proteins to recognize self from nonself. It depends on the interrelationships between antigen-presenting cells (APCs) and dendritic cells to effector cells, such as lymphocytes and monocytes, and the humoral immune system. Despite intensive research aimed at identifying cancer-specific antigens for use in directed therapy and vaccines, the apparent lack of specific cancer antigens has complicated this effort. In addition, the cancer state causes widespread immune system suppression, affecting dendritic cells and their production of lymphokines and monokines, cell-signaling molecules. In patients with head and neck cancer, the native output of thymic T-cells is less than that in healthy controls. One current area of work uses TILs to target tumors by sensitizing them to tumor antigens outside the body and then reintroducing them, making TILs home in on the neoplasm. Patients with head and neck cancer who have a high percentage of apoptotic TILs have lower 5-year survival rates. Other immune modifications include packaging genes with TIL, such as cytokine tumor necrosis factor (TNF), which causes local tumor cell lysis without systemic side effects. Class I MHC markers such as leukocyte antigen human leukocyte antigen (HLA)-B7 likewise could be activated into populations of tumor cells, leading to expression on the tumor cell surface with subsequent rejection and destruction by the immune apparatus. In addition to systemic factors, local factors allow the maintenance of the cancer state. In squamous cell carcinoma of the head and neck, along with most other cancer conditions, the tumor secretes angiogenic growth factors that promote vascular proliferation. This enables the tumor to grow, because nutrient constraints would eventually limit the tumor's volume unless a new source of nutrition were found. This fact has remarkable implications for newer antiangiogenesis drugs that fight cancer. The latest antineoplastic drugs include this class of antiangiogenesis compounds. Bevacizumab, a monoclonal antibody that targets this phenomenon of angiogenesis, has shown promise in clinical trials of breast, lung, and colorectal cancer treatment, prolonging survival. Matrix metalloproteinases (MMP) are a family of proteins involved in degrading the extracellular matrix (ECM) framework of cells, including collagen. Attention has been focused on these molecules because of the potential of metastasis in cells that have this ability to invade the basement membrane. In head and neck cancer cell lines, tumor, and primary larynx cancer, levels of MMP were indeed found to be elevated. Part of this elevation may be in relation to epidermal growth factor (EGF). Overall, the genetics behind carcinoma in the head and neck region are complex  ; environmental influences play a significant role. This is in contrast to some other cancers, such as retinoblastoma, which have a simple Mendelian inheritance pattern. Perhaps the greatest growth in our understanding of cancer is at the cellular level. Methods that elucidate genomic cancer hotspots include evaluation of chromosomal loss of heterozygosity. Besides gene mutations, other mechanisms of loss of function of an allele may have the same effect. For example, a genetic change that affects a homozygous deletion of a tumor suppressor gene may be a sentinel cancer event. Maternal and paternal alleles in normal tissue are compared with the same in tumor tissue, and the areas of loss or gain are identified. This is aided by analysis of microsatellite markers, which are tandem repeats of the genetic code in mostly noncoding areas. By amplifying these flanking areas around genes through the polymerase chain reaction (PCR), specific genes of interest that correspond to the loss or gain are identified. [11, 12] In this fashion, a map of where to search for candidate genes involved in molecular oncogenesis is created. In the normal noncancer state, the cell cycle is tightly regulated (see the following image); only a few tissue types have cells that are constantly dividing (eg, skin, mucosa). Other cells go into a state of senescence, whereby they no longer grow and divide. In vitro, cells in culture, such as fibroblasts, divide for only a limited number of cycles. Also, as the cells grow and multiply, they respect the boundaries of neighboring cells. In the cancer cell, however, both of these usual mechanisms are lost; this is abundantly clear in culture. Cancer cells may be continually regenerated and, unabated, will grow in a disorganized manner. 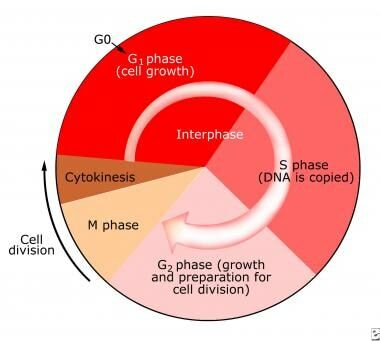 Once normal cells enter the quiescent phase of cells leaving the mitotic cycle (G0), or cell senescence, they do not reenter the cycle of growth, synthesis of proteins and DNA, and mitotic division. The gate of entry back into the replicative cycle is the domain of oncogenes, which facilitate entry, and tumor suppressor genes, which block the pathway. Other oncogenes operative in head and neck cancer resemble this model of tyrosine kinase phosphorylation of key molecules that leads to cell division (eg, human epidermal growth factor receptor [EGFR], the STAT3 protein, myc, ERBB2). Cetuximab, a monoclonal antibody against EGFR, has been approved for use in human head and neck cancer chemotherapy. Its action is to bind EGFR, thereby preventing epidermal growth factor (EGF) from binding to the cell surface and stimulating cell growth. EGFR overexpression is believed to be an early event in carcinogenesis. Its expression is increased with increased severity of premalignant lesions. In larynx cancer, levels of EGFR have been found to correlate with metastasis-free survival and overall survival. Downstream from EGFR, the signal transducing and activators of transcription (STATs) are phosphorylated and activated by the tyrosine kinase region of EGFR. They then bind to DNA promoters and effect gene transcription. It may have an antiapoptotic role and has also been found to be a likely early event in the progression to head and neck cancer. Tumor suppressor genes work in much the opposite fashion. In its hypophosphorylated state, Rb binds and inactivates a transcription factor, EF1, which is responsible for entry into the cell cycle. RB resides on chromosome 13q, and, although loss in this region has been found in head and neck cancer, RB gene mutation has been inconsistently identified. The p53 protein product is perhaps the most widespread cancer mutation, germane to discussion of head and neck cancer as well. It acts slightly upstream of Rb in the cycle, at the G1/synthesis (S) checkpoint. Normally, p53 is upregulated in response to cellular injury and DNA damage, arresting the cell at this checkpoint. Apoptosis may begin if the damage is irrevocable. With mutant p53, however, this important check is lost, and the cell proceeds with DNA synthesis and cycling. p53 is located on chromosome 17p, another area identified as abnormal in human head and neck squamous cell cancer. Studies that examine the relation of p53 to head and neck cancer have found mutations in 33-59% of tumors. However, clinical correlations of this significance in prognosis have been equivocal. One study has shown an increasing prevalence of p53 mutation with increasing histologic severity in invasive head and neck cancer. Another well worked-out pathway of tumor suppressors concern the p family of proteins (p16, p14, p21, p27). These molecules prevent the phosphorylation of Rb and, therefore, the cell's continuation in the cycle as well. p16 has been studied in some detail. It binds to and inactivates the cyclin-dependent kinases CDK4 and CDK6, preventing the phosphorylation of Rb; thus, the cell's continuation through the G1/S growth checkpoint. The method of faulty p16 production appears to be via hypermethylation of its promoter, a form of gene silencing that does not involve sequence mutation. The p16 gene resides on chromosome 9p21, an area previously shown to be marked by allelic imbalance and loss. In the nucleus of the cell, DNA replication occurs during the synthesis phase (see the image below). In the normal state, this process is highly accurate, with the frequency of an error occurring estimated at 1 in a billion base pairs per cell generation. Nonetheless, however precise, this system has potential for intrinsic mutations with each passage of the cell through the cycle of division. To combat potential intrinsic mutations, numerous DNA repair enzymes help to ensure the fidelity of the genetic code; however, even these systems are imperfect and may allow genetic change or mutation. The importance of these repair enzymes is clearly evident in the disease xeroderma pigmentosum, in which a defect in these systems allows unchecked DNA damage from ultraviolet light. Persons with this disorder develop squamous cell carcinoma, basal cell carcinoma, and melanoma of the skin, often at a very early age. Another mechanism to ensure the appropriateness of the cell is apoptosis. As discussed earlier, p53 protein promotes apoptosis in response to DNA damage. A different protein, Bcl-2, blocks this apoptosis and, in so doing, allows the continuation of the cell through the cycle. In essence, Bcl-2—which has been shown to be overexpressed in human squamous cell carcinoma as well as in its namesake, B-cell lymphoma—prolongs cellular survival. Another enzyme that may do the same but in a different fashion is telomerase. Telomeres are the ends of DNA strands. They are normally not well replicated and thereby shorten with each replication cycle. By doing so, telomeres function as cellular clocks, keeping track of how many times a cell has divided, until it ultimately remains in a quiet state. Telomerase is an enzyme that is able to lengthen these shortened ends and thus prolong the period in which the cell may divide. It is normally found in germ cells and at low levels in regenerating tissues. Research has highlighted this molecule in human cancers, showing it to be present in up to 90% of all cancers, including head and neck cancer. Nuclear factor kappa B (NFkB), a cytosolic protein, is normally bound to inhibitor factor kappa B (IkB). IkB is degraded in response to inflammatory cytokines. NFkB also has binding sites for cytokines such as interleukin (IL)-1 and then translocates to the nucleus, where it functions as a transcription factor, having either inhibitory or activating function. Possible roles include immune modulation, inflammation, apoptosis, and cell division. Previously, a mouse model has shown NFkB to have a role in malignant transformation. 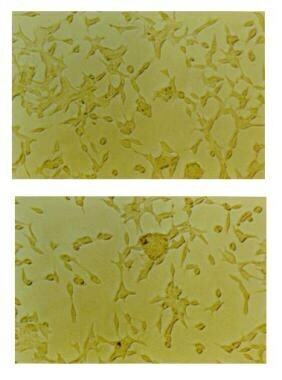 In head and neck cancer cell lines, inhibition of NFkB led to decreased growth. Multiple molecular targets in the signaling pathway of NFkB have also been shown to be altered in neoplastic transformation. The cellular inflammatory response may thus be an important source for propagation of cancer. Cyclooxygenase (COX)-1 and -2 upregulation leads to increased levels of prostaglandins in head and neck cancer. They may also play a part in decreasing apoptosis and increasing angiogenesis through an increase in vascular endothelial growth factor. Clinical studies are ongoing to see if COX inhibitors may be useful as chemoprevention in head and neck cancer, as it has been found for colon cancer. A study that looked at a COX-2 inhibitor, celecoxib, in chemoprevention of oral precancerous lesions showed that COX-2 is overexpressed in a number of premalignant and malignant oral lesions. This is linked to inhibition of apoptosis and metastasizing potential. Administration of celecoxib in a mouse model of oral cancer delayed the onset of early lesions and slowed the growth of established oral tumors. The effect was dose dependent. Chemopreventive measures that involve the administration of retinoid agents have also shown promise in in vivo studies and premalignant head and neck lesions. The retinoic acid receptor family comprises nuclear receptors similar to thyroid and steroid hormones. They function as ligand-dependent transcription factors and are involved in cellular growth, as well as in angiogenesis. It is probable that no one pathway alone is responsible for squamous cell cancer; rather, like the colon cancer model, many pathways converge to cause this cancer. Multiple mitigating and inciting influences also exist. Advanced age, for example, with the accumulation of genetic changes over time and possible immune suppression, adds to the increased risk of head and neck carcinoma. The genetic changes, aside from the specific mutations discussed, can be grouped into a larger category of genetic change: chromosomal imbalance. Chromosomal imbalance includes chromosomal instability and break points, translocation, amplification and deletion, oncogene activation, and methylation. The complex external milieu of the cell, with cancer promoting angiogenesis, and the body's natural homeostasis, which favors a steady state, are also factors. Ultimately, both environment and genetics underlie cancer development in susceptible individuals. The next frontier in research for squamous cell cancer of the head and neck is in the evolution of newer and better treatments. Because so much has been learned about the genetics of cancer, targeted therapies are possible. Gene therapy has gone from theory to practicality in the form of a number of current research trials that target head and neck cancer. [22, 23, 24, 25, 26, 27, 28, 29] This modality makes sense in the head and neck region, because this region is readily accessible for treatment and injection and is easily monitored  ; furthermore, the current disease management has much morbidity and potential for disfigurement, as well as continuing poor prognosis in the later stages. In vitro, antisense DNA technology against the cyclin family of oncogenes has been used with some success. Human trials have included a marginally successful attempt to replace the wild-type p53 protein in tumors. Human trials have also been undertaken using adenovirus without the E1B region, which normally inactivates p53, with the goal of the virus targeting cells with abnormal p53, such as cancer cells. Some subjects’ disease partially responded to this treatment. Another approach has been to inject the class I major histocompatability complex (MHC) molecule into tumors to incite a brisk immune response. This, too, has succeeded in only a few cases. Other technology that derives from our understanding of the molecular basis for human squamous cell carcinoma includes vaccines. In advanced melanoma, vaccines are made using patients' own immune cells that are selected and sensitized to the tumor and then replaced. This technique has proved promising in a number of patients. Use of various chemokines such as interleukin and tumor necrosis factor (TNF) has been attempted with some response but at the expense of often burdensome adverse effects. One other area in which multiple drugs are being developed is monoclonal antibodies. Blocking antibodies against the epidermal growth factor (EGF) receptor have been used, again, with variable effect. Clearly then, the clinical translational arm of current research is in its nascent stage. As the growth in knowledge of the fundamentals of cell biology continues, understanding of head and neck squamous cell carcinoma, a complex disease, will progress. Future research will focus on deciphering how molecules and molecular events affect staging and prognosis. New tumor markers have yet to be defined. The ultimate goals include the reduction and prevention of head and neck cancer, which is possible with awareness and tobacco cessation programs, and a simple effective treatment that will lead to a favorable prognosis. Belbin TJ, Singh B, Smith RV, et al. Molecular profiling of tumor progression in head and neck cancer. Arch Otolaryngol Head Neck Surg. 2005 Jan. 131(1):10-8. [Medline]. Carey TE, Wennerberg J. Cellular and molecular biology of the cancer cell. Head and Neck Pathology. Head and Neck Pathology; 2001. 3-37. Ha P, Goldenberg D, Walpoe M. Otolaryngology: Head and Neck Surgery. Molecular biology of head and neck cancer. Cummings; 2005. O'Malley Jr BW, Li D, Staecker H. Otolaryngology: Head & Neck Surgery. Fundamentals of molecular biology and gene therapy. Cummings; 2005. Scher RL, Richtsmeier WJ. Tumor biology and immunology of head and neck cancer. Head and Neck Surgery: Otolaryngology. Lippincott Williams & Wilkins; 1998. Vol 2: 1401-13. Calabrese P, Tsao JL, Yatabe Y, et al. Colorectal pretumor progression before and after loss of DNA mismatch repair. Am J Pathol. 2004 Apr. 164(4):1447-53. [Medline]. [Full Text]. Mirghani H, Moreau F, Lefèvre M, et al. Human papillomavirus type 16 oropharyngeal cancers in lymph nodes as a marker of metastases. Arch Otolaryngol Head Neck Surg. 2011 Sep. 137(9):910-4. [Medline]. Ngamphaiboon N, Chureemas T, Siripoon T, et al. Characteristics and impact of programmed death-ligand 1 expression, CD8+ tumor-infiltrating lymphocytes, and p16 status in head and neck squamous cell carcinoma. Med Oncol. 2019 Jan 21. 36 (2):21. [Medline]. Shimizu S, Hiratsuka H, Koike K, et al. Tumor-infiltrating CD8+ T-cell density is an independent prognostic marker for oral squamous cell carcinoma. Cancer Med. 2019 Jan. 8 (1):80-93. [Medline]. [Full Text]. Gleich LL, Salamone FN. Molecular genetics of head and neck cancer. Cancer Control. 2002 Sep-Oct. 9(5):369-78. [Medline]. Knuutila S, Bjorkqvist AM, Autio K, et al. DNA copy number amplifications in human neoplasms: review of comparative genomic hybridization studies. Am J Pathol. 1998 May. 152(5):1107-23. [Medline]. Rawnsley JD, Srivatsan ES, Chakrabarti R, et al. Deletion analysis of the p16/CDKN2 gene in head and neck squamous cell carcinoma using quantitative polymerase chain reaction method. Arch Otolaryngol Head Neck Surg. 1997 Aug. 123(8):863-7. [Medline]. Nakashima T, Clayman GL. Antisense inhibition of cyclin D1 in human head and neck squamous cell carcinoma. Arch Otolaryngol Head Neck Surg. 2000 Aug. 126(8):957-61. [Medline]. Wang MB, Billings KR, Venkatesan N, et al. Inhibition of cell proliferation in head and neck squamous cell carcinoma cell lines with antisense cyclin D1. Otolaryngol Head Neck Surg. 1998 Dec. 119(6):593-9. [Medline]. Wang MB, Alavi S, Engstrom M, et al. Detection of chromosome 11q13 amplification in head and neck cancer using fluorescence in situ hybridization. Anticancer Res. 1999 Mar-Apr. 19(2A):925-31. [Medline]. Herrero R, Castellsague X, Pawlita M, et al. Human papillomavirus and oral cancer: the International Agency for Research on Cancer multicenter study. J Natl Cancer Inst. 2003 Dec 3. 95(23):1772-83. [Medline]. Dhingra V, Verma J, Misra V, Srivastav S, Hasan F. Evaluation of Cyclin D1 expression in Head and Neck Squamous Cell Carcinoma. J Clin Diagn Res. 2017 Feb. 11 (2):EC01-4. [Medline]. Chang EH, Jang YJ, Hao Z, et al. Restoration of the G1 checkpoint and the apoptotic pathway mediated by wild-type p53 sensitizes squamous cell carcinoma of the head and neck to radiotherapy. Arch Otolaryngol Head Neck Surg. 1997 May. 123(5):507-12. [Medline]. Liu S, Shi L, Yang X, et al. Nuclear survivin promoted by acetylation is associated with the aggressive phenotype of oral squamous cell carcinoma. Cell Cycle. 2017 Apr 6. [Medline]. Feng L, Wang Z. Chemopreventive effect of celecoxib in oral precancers and cancers. Laryngoscope. 2006 Oct. 116(10):1842-5. [Medline]. Kalfert D, Pesta M, Kulda V, et al. MicroRNA Profile in Site-specific Head and Neck Squamous Cell Cancer. Anticancer Res. 2015 Apr. 35(4):2455-63. [Medline]. Anderson WF. Gene therapy. Sci Am. 1995 Sep. 273(3):124-8. [Medline]. Clayman GL, Sicard MW. Gene therapy. Head and Neck Surgery: Otolaryngology. Lippincott Williams & Wilkins; 1998. Vol 2.: 1361-7. Gleich LL. Gene therapy for head and neck cancer. Laryngoscope. 2000 May. 110(5 Pt 1):708-26. [Medline]. Green NK, McNeish IA. Principles of gene therapy: prospects for the treatment of head and neck cancer. J Laryngol Otol. 1998 Oct. 112(10):913-20. [Medline]. Lang S, Zeidler R, Mayer A, et al. Targeting head and neck cancer by GM-CSF-mediated gene therapy in vitro. Anticancer Res. 1999 Nov-Dec. 19(6B):5335-9. [Medline]. Li D, Jiang W, Bishop JS, et al. Combination surgery and nonviral interleukin 2 gene therapy for head and neck cancer. Clin Cancer Res. 1999 Jun. 5(6):1551-6. [Medline]. McGuire JF, Casado B. Proteomics: a primer for otologists. Otol Neurotol. 2004 Sep. 25(5):842-9. [Medline]. Salmons B, Gunzburg WH. Targeting of retroviral vectors for gene therapy. Hum Gene Ther. 1993 Apr. 4(2):129-41. [Medline]. Clayman GL, Dreiling LK. Injectable modalities as local and regional strategies for head and neck cancer. Hematol Oncol Clin North Am. 1999 Aug. 13(4):787-810, viii. [Medline]. Clayman GL, Liu TJ, Overholt SM, et al. Gene therapy for head and neck cancer. Comparing the tumor suppressor gene p53 and a cell cycle regulator WAF1/CIP1 (p21). Arch Otolaryngol Head Neck Surg. 1996 May. 122(5):489-93. [Medline]. Goebel EA, Davidson BL, Zabner J, et al. Adenovirus-mediated gene therapy for head and neck squamous cell carcinomas. Ann Otol Rhinol Laryngol. 1996 Jul. 105(7):562-7. [Medline]. Weber RG, Scheer M, Born IA, et al. Recurrent chromosomal imbalances detected in biopsy material from oral premalignant and malignant lesions by combined tissue microdissection, universal DNA amplification, and comparative genomic hybridization. Am J Pathol. 1998 Jul. 153(1):295-303. [Medline]. Wolff E, Girod S, Liehr T, et al. Oral squamous cell carcinomas are characterized by a rather uniform pattern of genomic imbalances detected by comparative genomic hybridisation. Oral Oncol. 1998 May. 34(3):186-90. [Medline].